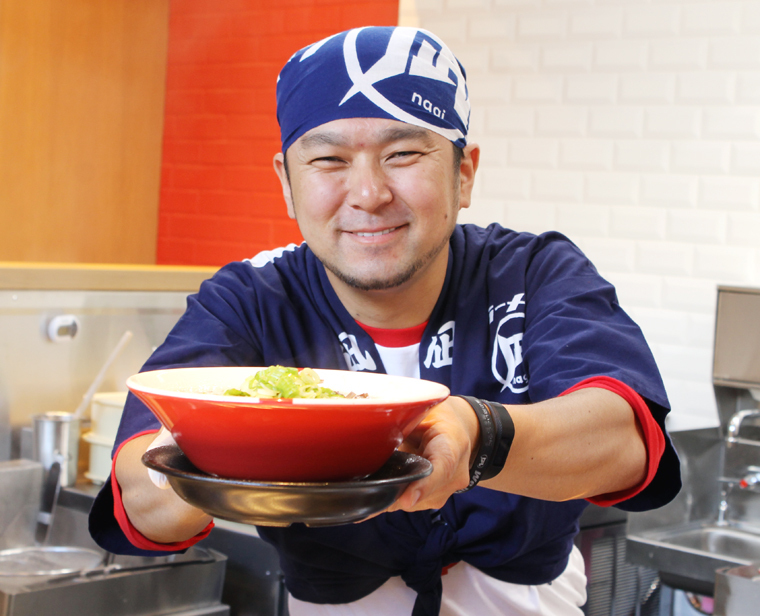 Chef-Owner Satoshi Ikuta realizes a dream by opening his first U.S. branch of his Ramen Nagi. 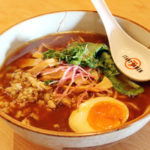 Ramen Nagi doesn’t open until June 25 in downtown Palo Alto, but you might as well get in line pronto for the first outpost in the United States of this Tokyo ramen chain that boasts 35 locations in Asia. I can’t say I’ve eaten at every ramen joint in the Bay Area, but I’ve definitely enjoyed my fair share. 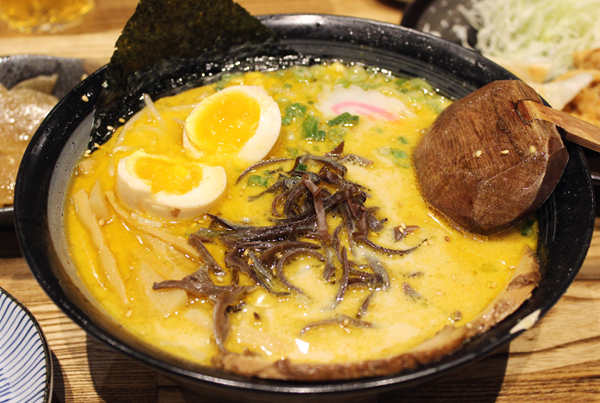 And Ramen Nagi’s may be the best I’ve had. These noodles, made fresh on site every day, are a cut above. 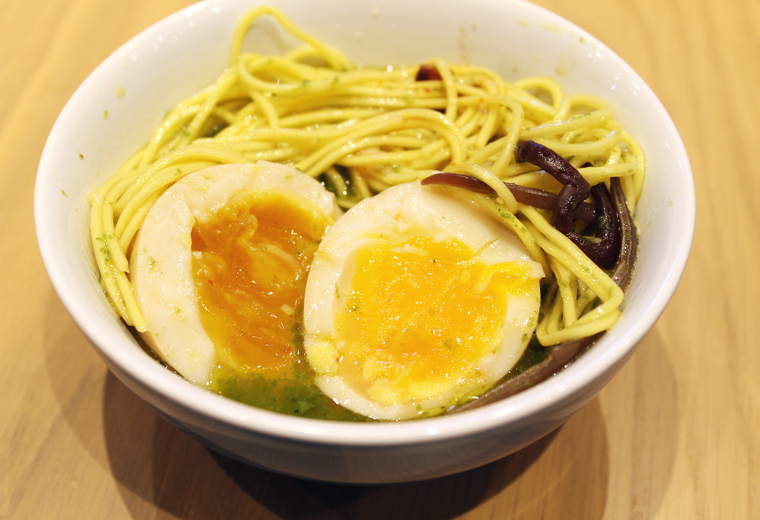 Basil and parmesan ramen — yes, really. At a sneak preview media dinner a week before the official opening, I had a chance to sample five different bowls of ramen, plus a variety of side dishes, most of which are not available at any other Ramen Nagi locale elsewhere. 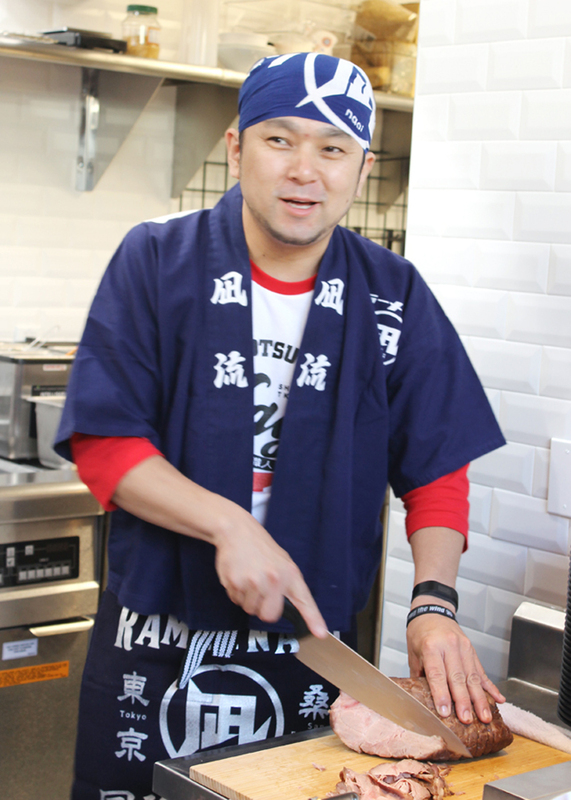 Chef-Owner Satoshi Ikuta, who founded Ramen Nagi in 20014, even flew in from Tokyo for the occasion. 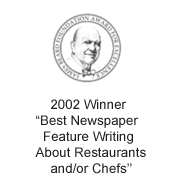 The chef-mascot at the front of the restaurant. The long, narrow dining room with the kitchen at the back. The dining room accented with red. 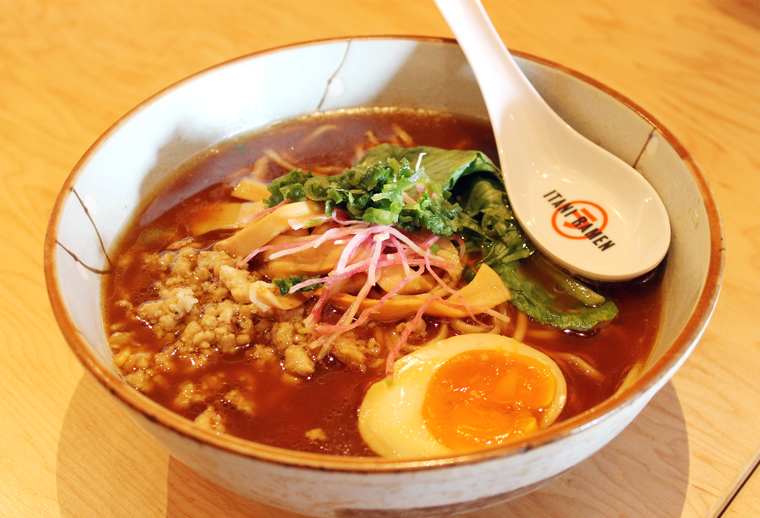 The ramen, $13 to $14 a bowl, can be customized to your preference. Choose how strong in flavor, rich in oil, and garlicky you prefer your broth, as well as if thin or thick noodles and how soft or firm you want them. You can also opt for pork loin or pork belly, green onions or cabbage. 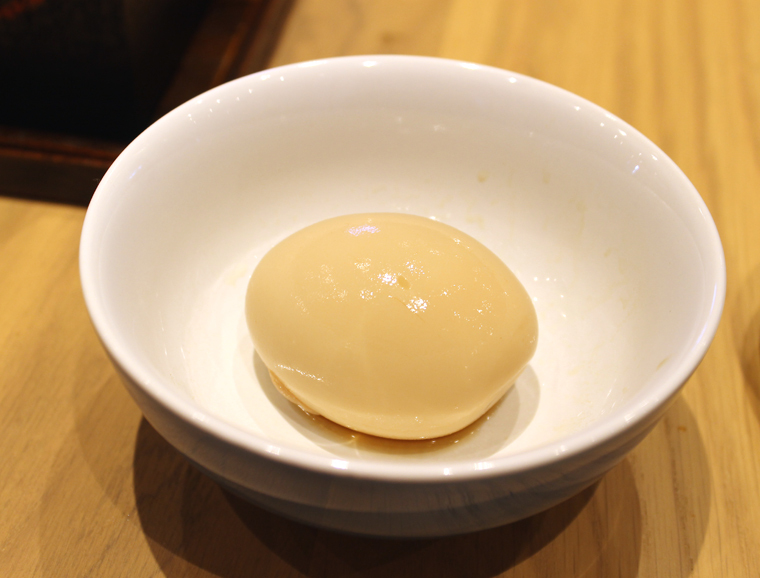 Extras, for a nominal charge, include a soft whole tamago (egg), extra pork, extra noodles or extra vegetables. The noodles are made fresh every day on site. They have a noticeable yellow hue to them, thanks to egg powder. 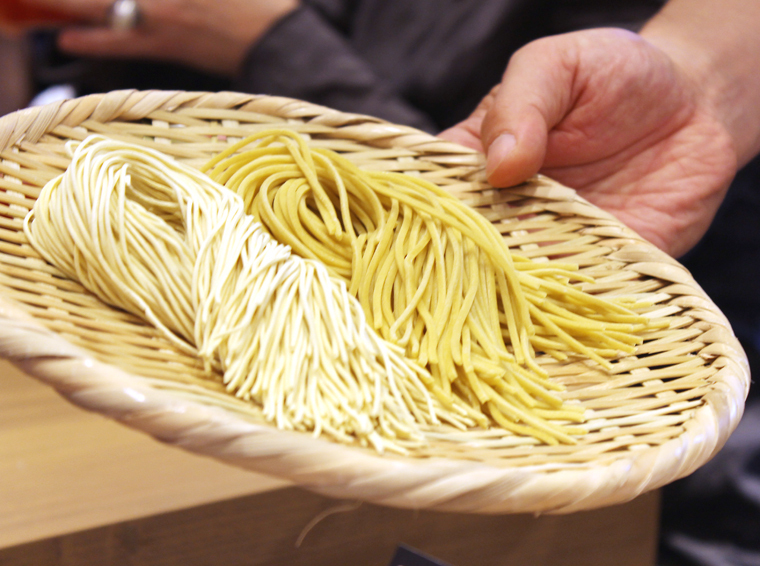 These are noodles that make you sit up and take notice. They have character, chew, springiness and flavor all on their own. 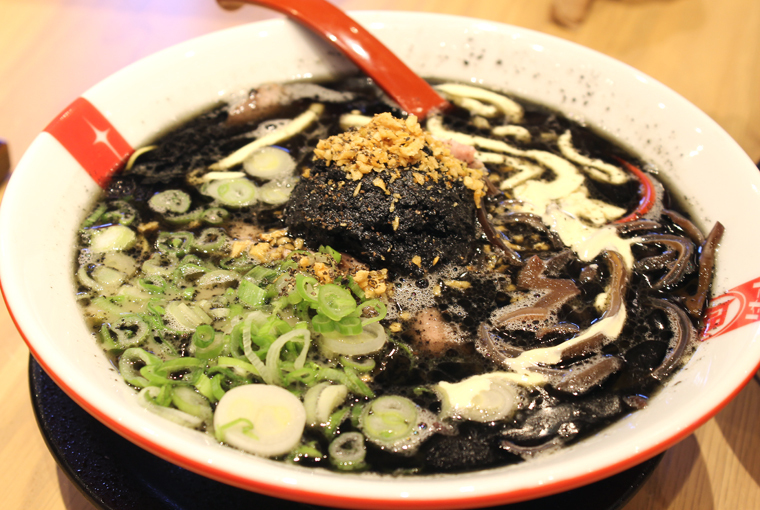 The “Original King” with tonkotsu broth. 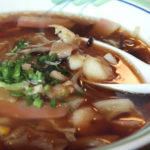 My favorite might have to be the “Original King,” spotlighting tonkotsu broth. I often find other ramen broths to be quite salty. But this one is different. What really shines through is how incredibly porky it tastes. It’s as if the best pork belly had been put through a Vitamix to churn out a broth with the intense essence of that rich meat. Yes, liquid pork belly, if you will. It’s flat out fabulous, and pure pleasure to spoon up to the last drop. The squid ink one is deep, dark and mysterious looking with the distinct briny-metallic taste of the ink rounded out by black garlic. 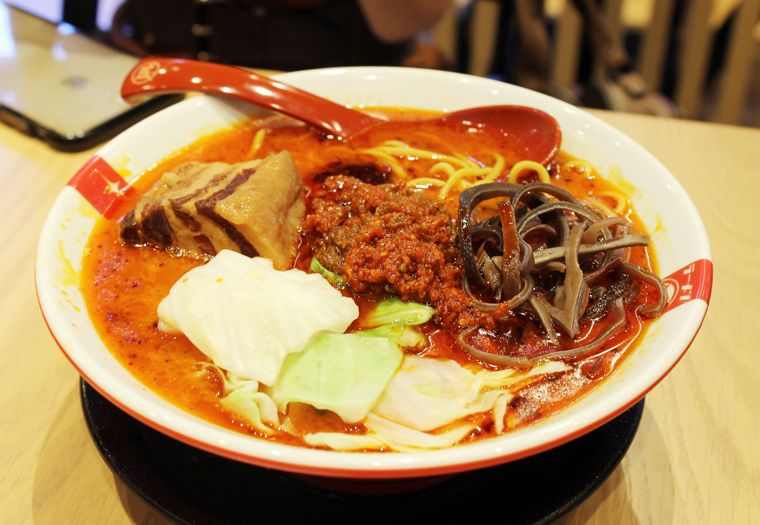 The spicy ramen has red chili oil and a ball of red miso and chiles in the center. 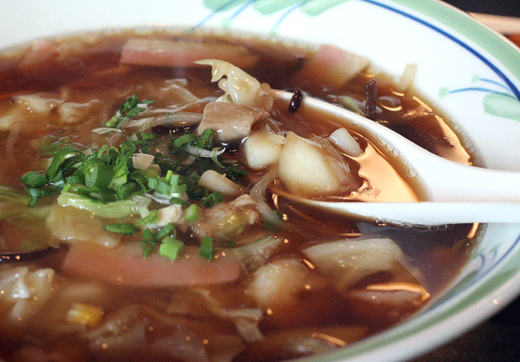 The version I tried was moderate in spice, but you can always request the broth be spicier or even order it with a lot more Nagi Fire Sauce to really give the taste buds an explosion. 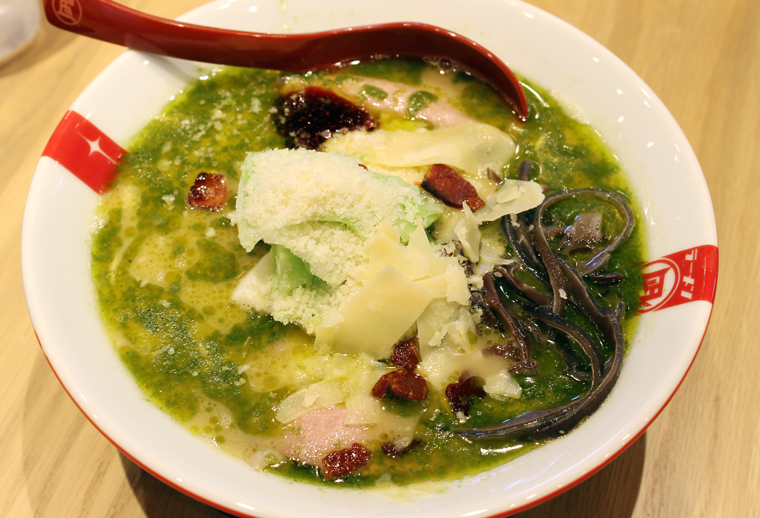 The basil-parmesan ramen was very unusual, like mixing pork broth with a heap of pesto. Both finely grated, as well as shards of parmesan, flavor the green-hued sauce. 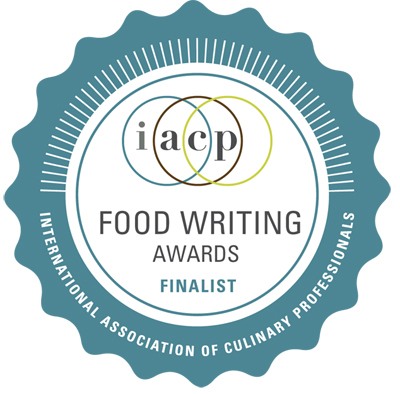 It’s East meets Italy for a taste of something really different. Both the pork loin (chasu) and pork belly were very tender and juicy. You can’t go wrong with one or the other — or both. Ikuta also let us try a special vegetarian ramen that he’s working on. The broth is made with onions, cauliflower, garlic and milk. It’s much lighter tasting, with a delicate, satisfying flavor. Instead of pork, there were two thin hash browns garnishing the bowl. I think more mushrooms would have been a better choice because the hash browns quickly turned soggy, and uninteresting. 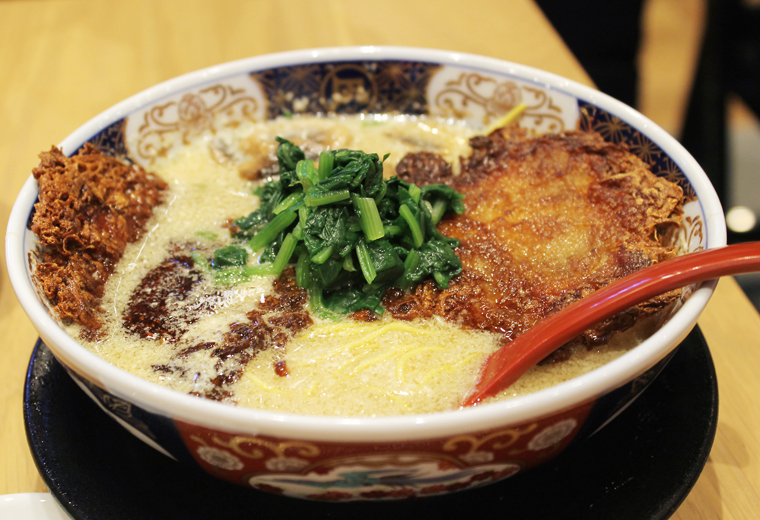 There are three steps when approaching any bowl of ramen set before you, the chef instructed. First, try the broth by itself. Second, mix in the Nagi Fire Sauce that garnishes the bowl. Lastly, try it all together with the noodles. Each table is also outfitted with condiments. 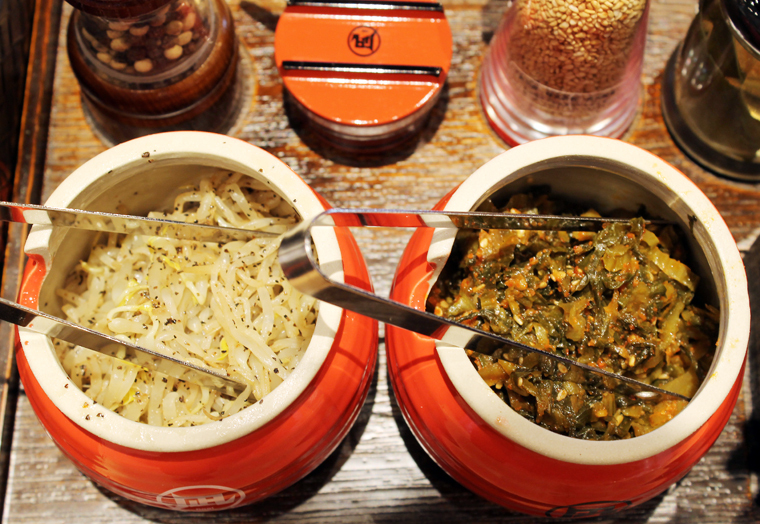 There are jars of marinated bean sprouts and spicy mustard greens, as well as fish powder. 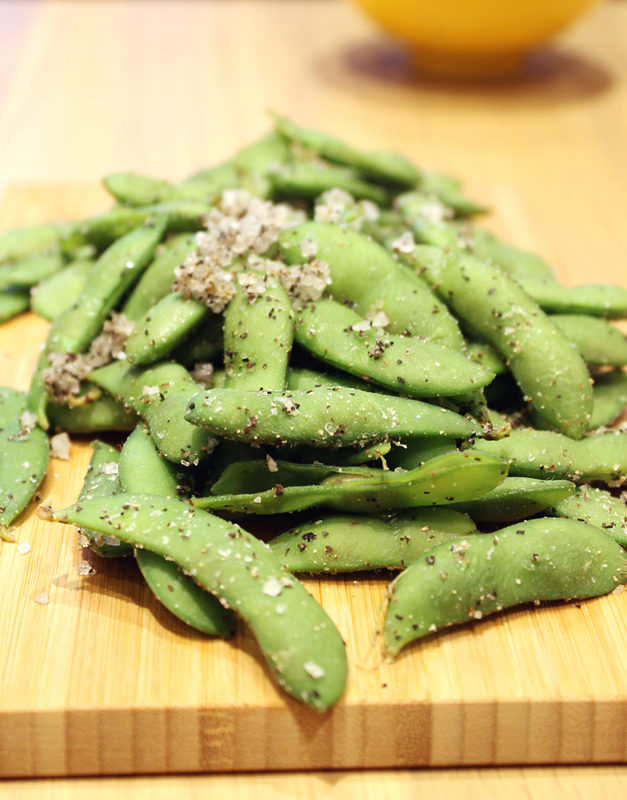 There’s also a bottle of seaweed vinegar, and a grinder to add sesame seeds to your bowl. Containers of chopsticks and forks are at the ready. In lieu of napkins, there’s a Kleenex box — albeit disguised in a chic black case. Jars and bottles of condiments on each table. 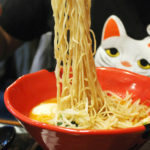 A bowl of ramen is supposed to be finished within 15 minutes of serving so that it’s enjoyed at its optimal temperature. 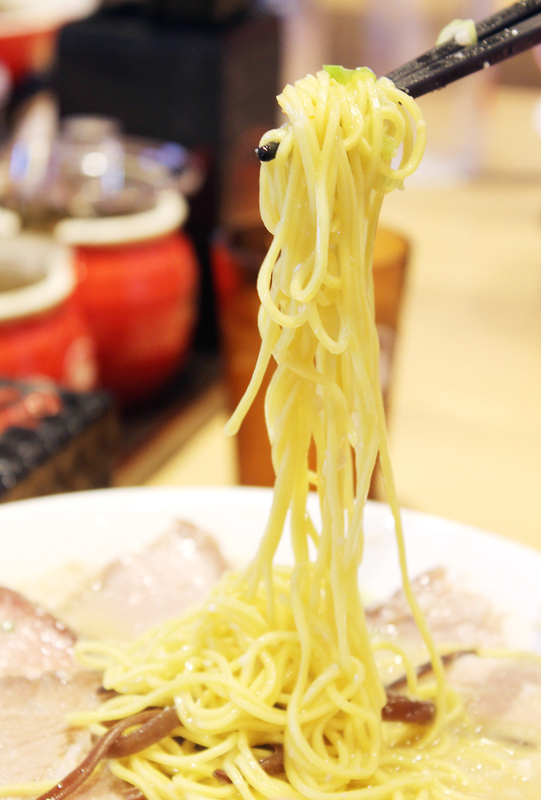 Ramen Nagi even uses specially made bowls that retain heat longer. 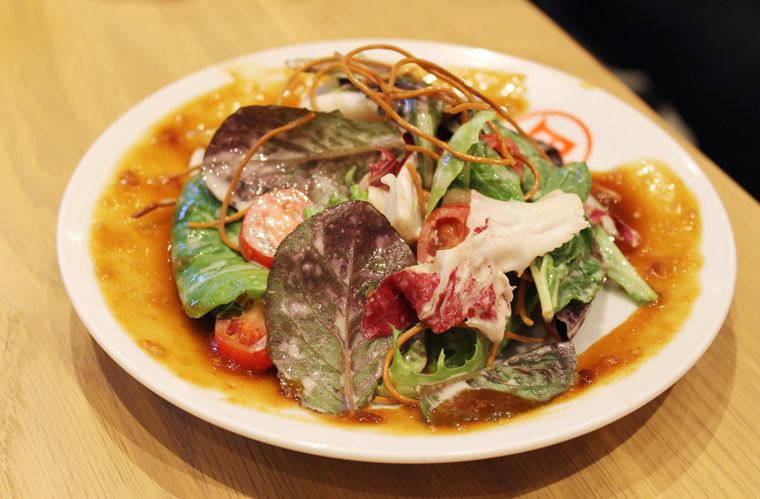 The sides, ($4 to $7), include edamame enlivened with garlic powder, sea salt and pepper; and the “Nagi Salad,” with lettuce, cherry tomatoes and fried ramen noodle garnish, finished with both a miso and a sesame dressing that added a lot of nuttiness and umami. 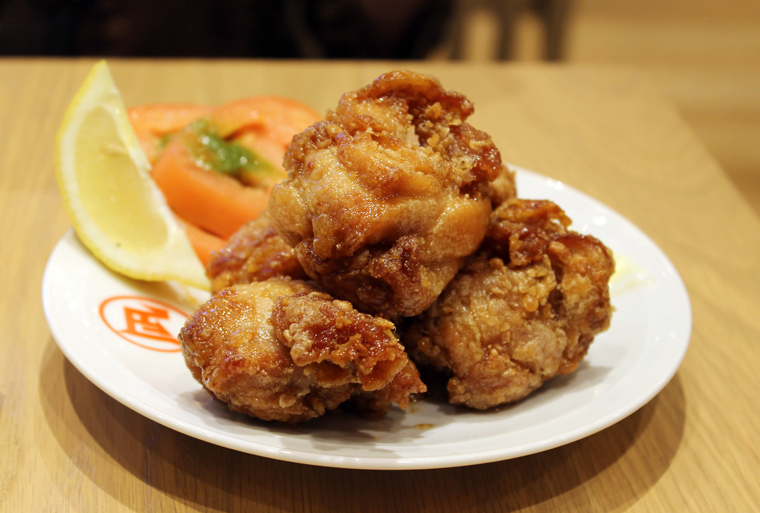 The chicken karaage arrive in big boneless pieces, deeply golden after being dusted in potato starch and fried. The chicken pieces are marinated overnight beforehand in shoyu and sake, rendering them incredibly moist, tender and juicy. The chicken is super crisp with a subtle sweetness. There’s a swipe of aioli mayo on the edge of the plate to add at will. 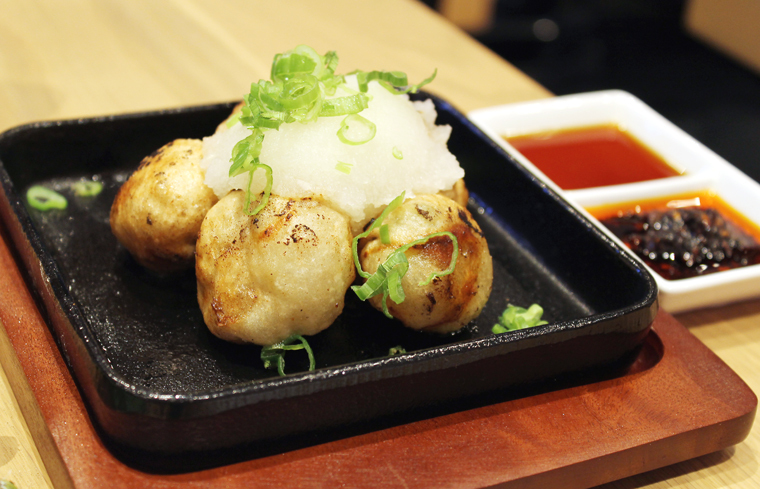 “Fist Gyoza” are round dumplings stuffed with cabbage and pork, then fried before being crowned with a cloud of grated daikon. These go down easily with one of the Japanese beers or sochu cocktails on the menu. 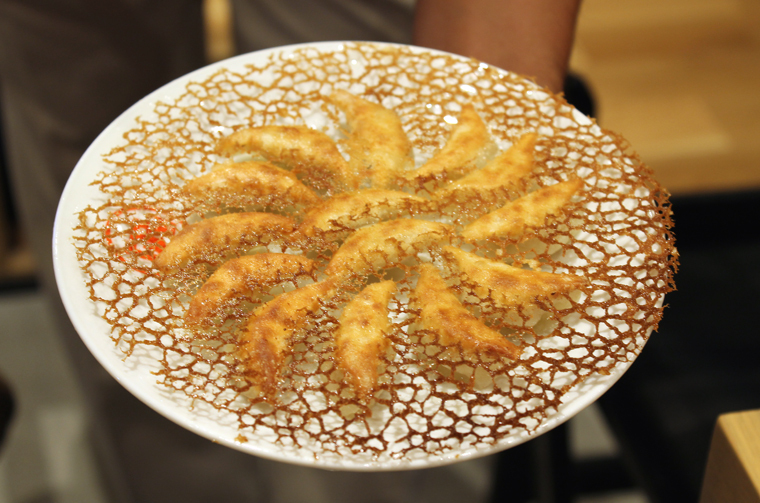 There’s also “Snack Gyoza,” 14 one-bite wonders that arrive held together by a crisp lace, created when they are pan-fried with just the right amount of oil, and flour and water slurry. Stuffed with pork, cabbage and garlic, these are tiny. You could easily eat a dozen without realizing it. A sweet-salty apple-based sauce accompanies them for a nice change from just the usual soy sauce. 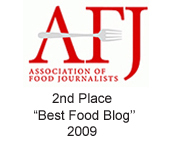 “Fist Gyoza,” pleated and folded tightly into a ball or fist before being fried. The “Katsu Roll” is more over the top. Thin slices of pork belly are rolled up around Monterey Jack cheese, then battered and fried. 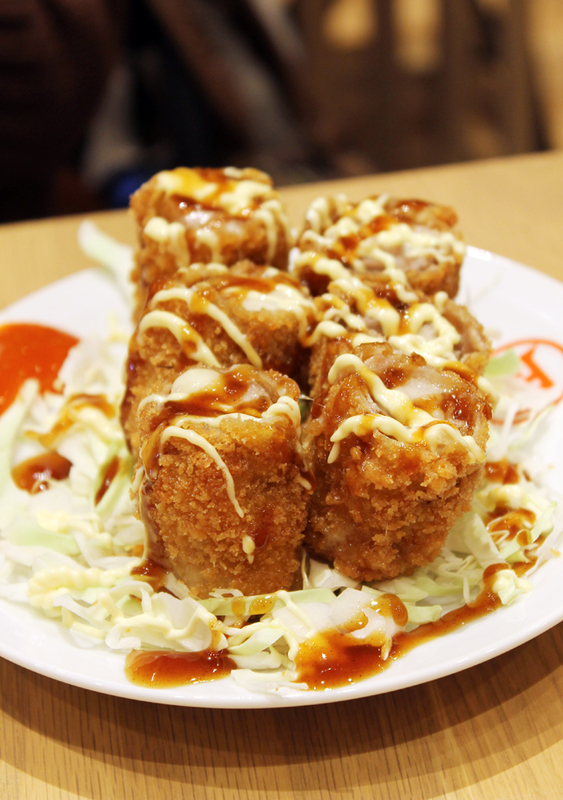 Served with a tonkatsu sauce, these are crunchy, ever so salty, and squirt juice when you bite into them. They are plenty rich, too. 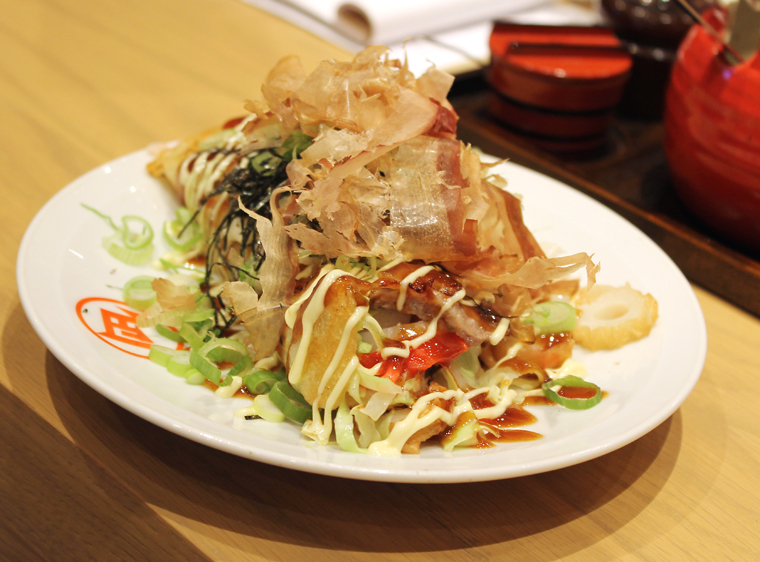 Okonomiyaki is offered in the Hiroshima-style, which is more like a thin crepe rather than Yokohama-style that’s like a thick pancake. Here, it’s stuffed with pork, fish balls, and cabbage before being showered with bonito flakes, and Japanese mayonnaise. 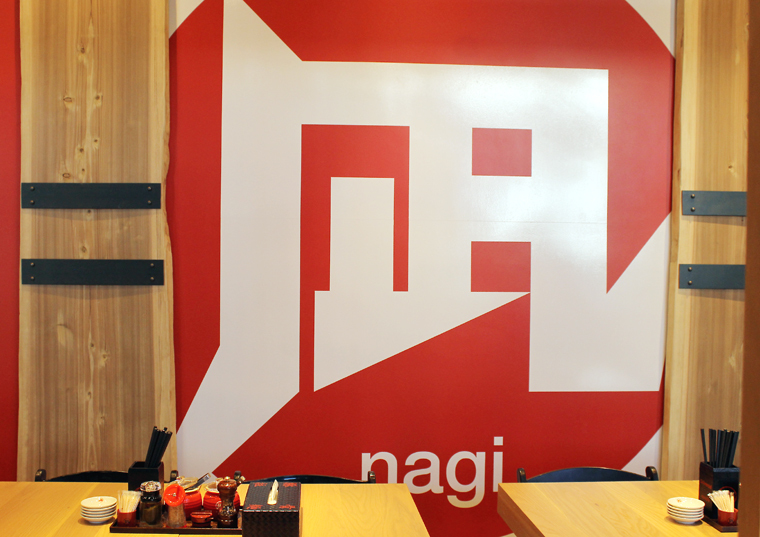 Ramen Nagi opens for dinner on June 25, then for lunch continuously through dinner on June 26. 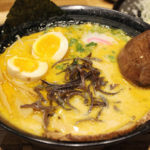 For those further afoot south, you’ll be happy to know a second Ramen Nagi is expected to open in the fall at the Westfield Valley Fair shopping center in San Jose. 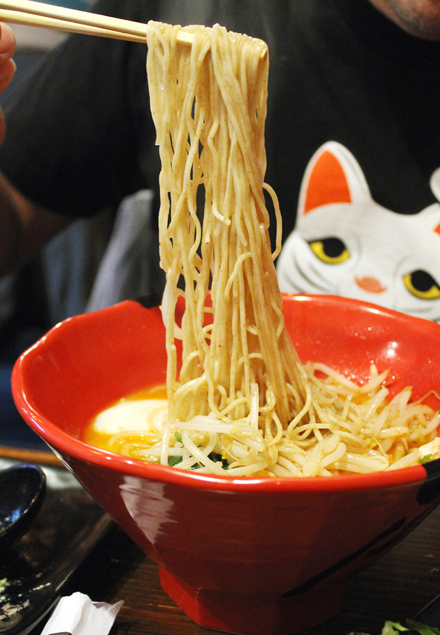 Get ready for ramen nirvana. Yummmm! 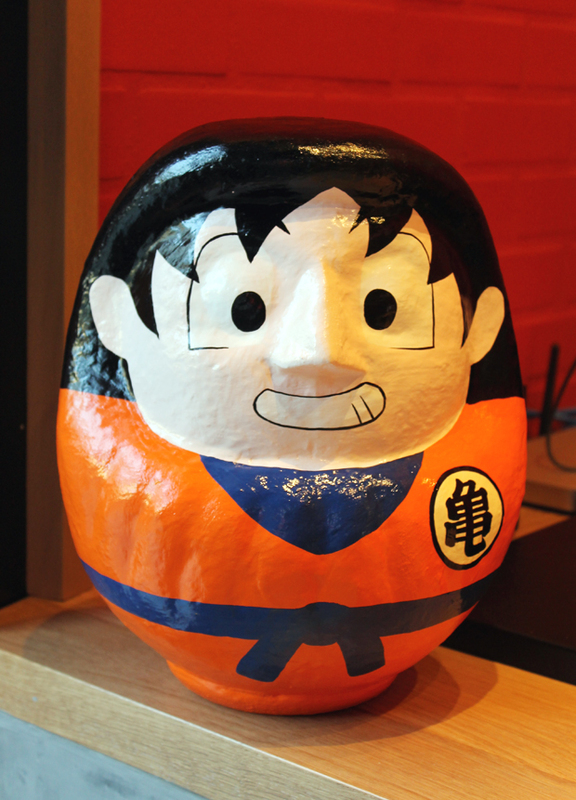 Makes me wanna go back to Japan! 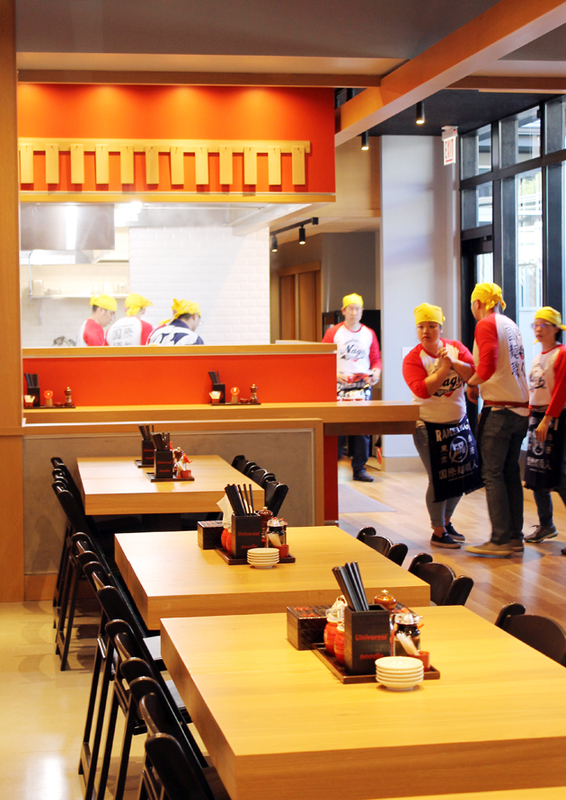 Woah, those gyoza looks amazing, and the ramen sounds fresh. I’m afraid of the lines already! Tonkatsu sauce is correct. 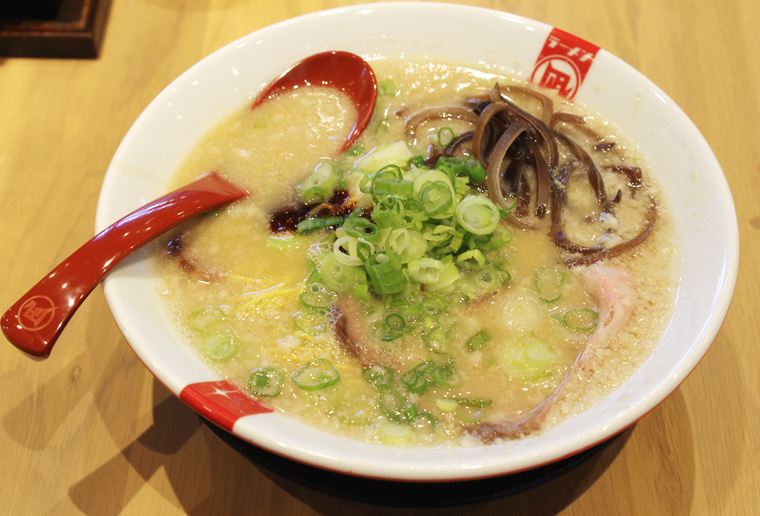 But ramen broth is Tonkotsu, spelled with o.